I can't give you all the details yet, but the Top Secret Web Comic Project is coming along nicely. All I can say right now is that I'm writing it and it's set in the universe of a very cool up and coming roleplaying game. I just got the first concept sketches for one of the main characters. I won't tell you the character's name yet, but she's cool and a very powerful magic user. The artwork was done by Laura Sloan ( http://bumberparty.blogspot.com/ )and though she will not be doing the artwork in the comic, I just had to share her cool concept art. No sketches of the steam punk robot yet, but when I get them (and get permission to post them) you'll see them. 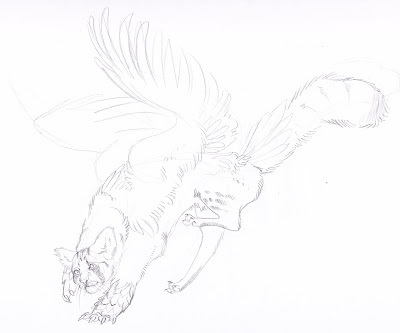 :) The concept she was given was: part Egyptian Mau, part Red-tailed Hawk, and part Wolverine. I think she did a wonderful job. I think they should swap the front legs and back legs- give the cat smaller front legs and have it land on its back paws. When I think of spellcasters, I think of them having to move their hands to make some kind of gestures- and those big front paws don't look like they could do that.